Six Sigma is a business methodology focused on improving the quality of goods or services an organization produces by reducing variance in the production process. Six Sigma leaders know that when a production process lacks the stability to create high-quality output consistently, it will continue producing defective products until someone intervenes and improves the process. Reducing variation requires constant monitoring and measurement as systems tend to erode if not kept in check. Over the years, Six Sigma practitioners have developed a set of tools and methods that address control, and problem-solving and improvement to eliminate defects and waste. Here are a few of the most essential. Standard work, it is the documentation of the best practices for any process or task at that given moment. It is created and updated by the people who do the work. It forms the baseline for improvement and ensures process consistency. An organized and well-stocked workplace essential in the quest to eliminate variation. The technique involves doing 5 things that all start with S in both English and Japanese. They consist of seiri (sort), seiton (set), seiso (shine), seiketsu (standardize), and shitsuke (sustain). A process control chart is a graph used to track how a process behaves over time. Data points are plotted in time order in a chart with a central line for the average (sometimes a median), an upper line for the upper control limit, and a lower line for the lower control limit. Process control charts help leaders avoid panicking over every up and downswing. They circumvent problems caused by only looking at average results, instead of the variations of results. The Japanese word “Gemba” means the real place. During a Gemba walk, the manager goes to the place where work is done to show respect for the employees, ask questions, and potentially identify opportunities for improvement. Hoshin Kanri (otherwise called, Policy Deployment) is a strategic planning approach designed to align the organization and ensure that everyone is working toward the same goals. The approach balances the need to achieve daily incremental improvement while moving toward the organization’s three to five-year breakthrough objectives at the same time. Kanban is a visualizing principle based on maximizing the flow of goods and work without unnecessary inventory or transportation. While initially used with physical cards at Toyota, Kanban has now moved to the cloud, and many organizations use digital Kanban boards to track the flow of work. Despite excellent control, sometimes problems will happen, or opportunities for improvement will be identified. In that case, one or more of the following Six Sigma tools can be deployed. A3 it is a structured problem-solving approach that gets its name from the size of paper that was used before digital tools became available. An A3 report is the result of an improvement cycle like DAMIC or PDSA. The Six Sigma technique of Catchball involves passing ideas from one person to another for feedback and action. The idea (ball) is set in motion when someone defines a challenge or opportunity. It then moves back and forth, up and down, or both until a plan is developed and agreed upon. DMAIC is a five-phase improvement cycle; define, measure, analyze, improve, control. It brings structure to the improvement process and makes sure that each change is based on careful analysis and useful data. It starts with the Standard Work and repeats whenever a new opportunity for improvement is identified. PDSA is an alternative improvement cycle that stands for Plan, Do, Study, Act. It is a simplified version of DMAIC that works best for improvement projects that are not heavy on statistics. The 5 Whys is a brilliantly simple method of getting to the root cause of a problem. By asking and answering the question, “why?” the basis of a problem can usually be found in five iterations. Value Stream Mapping is a Six Sigma tool for defining and assessing the movement of raw materials and work from the beginning of the process to delivery to the customer. It is the way the current state of a process is documented, and the basis for determining where waste can be eliminated or value added. 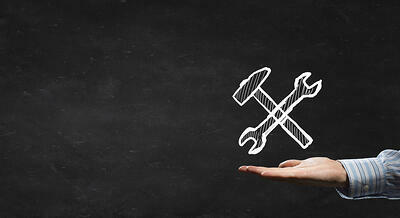 This list doesn’t cover every Six Sigma tool, but these are the necessities of the toolbox. You may find that you use all of them, or only a few, but some combination will likely help you achieve less variation as a rule, and know how to respond when challenges arise.